Because of the simplistic and durable design, the Model C is built to give trouble free operation for many years. Some of the older models are still in operation today and have been in use for over 20 years. The Model C Wire Stripper is also very easy to install. 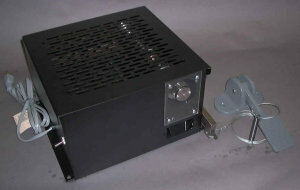 Over twenty years of experience building wire stripping machines led to the Model C.
SEND US SAMPLES OF YOUR WIRE. They will be stripped and returned free of charge for your evaluation. Our drilling machines are a high precision tool of the highest grade for handling drilling work of every description. The heat treated and ground spindle is guided in a vertical quill supported by annular bearings; thus none of the belt pull is transmitted to the spindle. Two spindle ball thrust bearings are provided to carry idle and drilling load. The sensitive feed of the handle enables the operator to avoid breaking drill bits. All vital parts are ground accurately to size and alignment including spindle, quill, feed column, main column, table (horizontal surface and apron) and base. The spindle is driven by an improved high speed, molded endless round belt. Spindle travel is accurately set by adjustable depth gauge. All motors are the ball bearing type and are available in 110, 220, or 440 volt, single or three phase, 60 cycle AC. Special motors are also available. Standard machines equipped with 110 volt, single phase motor comes with a six foot cord, switch and plug. 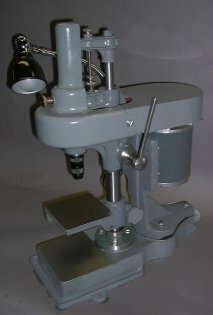 Two "off the shelf" models are available: The model R-53 drill press is our most popular model. The AF-7B is used for larger work pieces. Foot treadles are available for all models along with multiple spindle configurations. Custom drilling machines are also available and can be engineered specific for the job. Capacity - # 80 to ¼"
Maximum spindle travel = 2¼"
Table Dimensions: Horizontal surface = 5¼" x 5", apron = 1 7/8 " x 5"
Capacity - #0 to 5/16"
Maximum spindle travel = 2 3/8"
Drills to center of 11 ¾"
Max. distance of chuck to base = 10 7/8"
Max. distance of chuck to table = 8 ¾"
HS Assembly has also engineered and manufactured custom drilling machines to suit the specific needs of our customers. Some machines we have built utilize feeders to automatically feed the parts into the drilling machine while other machines utilize a multi-spindle arrangement for drilling holes simultaneously. Another system we built featured a programmable drilling machine where the spindle moved on a x-y plane over the work piece. Depending on your specific need and budget, we can present the best solution for the job. The machine shown is a two spindle arrangement utilizing air logic to sequence clamping the part, drilling, retracting the spindles, and unclamping.